The jet lag is a killer. 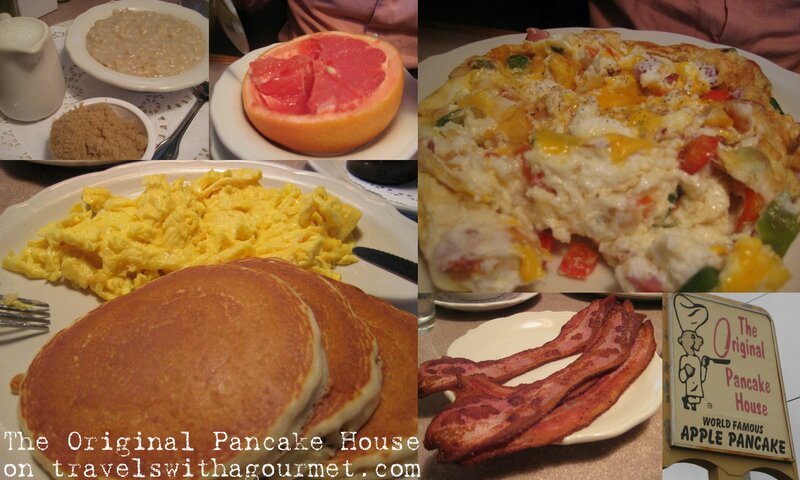 We all went to bed at 6 p.m., woke up at midnight and couldn’t go back to sleep, so we sat around and watched television waiting for the sun to rise so we could have breakfast at The Original Pancake House. American breakfasts are legendary – from the portions to the choices – pancakes, eggs, bacon, sausages and unlimited filter coffee. It’s one of the things we look forward to on every visit to the States. The Original Pancake House opens daily at 7:00 a.m. and we were one of the first customers to walk in the door this morning. We went straight to a booth and looked through the menu. Although there were many things we wanted to order, we almost always end up having the same thing – the Two by Four special of two eggs (usually scrambled) and four buttermilk pancakes with a side order of crispy sugar-cured hickory smoked bacon. My son and I share this plate and surprisingly for a 7-year old, he eats exactly half of the order. A orders several things off the menu – half a grapefruit, oatmeal with brown sugar and an egg white omelet of ham, onions, Swiss cheese and red and green peppers plus some toast. The food arrived quickly and the pancakes were the same – fluffy and served with whipped butter and a jug of maple syrup. The omelet was large, extra fluffy from the pure egg white mix, and filled with vegetables, ham and melted cheese. A large mug of their special-blend filter coffee was good and not too watery, the way diner coffee normally is. The free refill concept is hard to understand when compared to Europe’s espresso culture but in this kind of a place and with a large American breakfast, there’s nothing better than having your mug refilled continuously until you finally say stop. We could eat this kind of breakfast everyday but save it for when we’re away on vacation and can spend more time with each other, lingering over the breakfast table. We shared our food, finished all of it and had a fantastic time just the three of us having a super earl morning meal together. *This branch open daily from 7 a.m. to 3 p.m.
Hi Chinot, It was delicious!Hi Tim,You’re right about it being the best buttermilk pancake place (beats iHop any day). I’m thinking about stopping by for more pancakes before I head back to Spain.G.T. This has to be the best “chain” breakfast restaurant in America. Back in my Chicago days I made at least 3 stops weekly at the Rush/Cedar location. The basic buttermilk pancakes have an incredible flavor and full props to them for providing real butter and double cream with the coffee! This blog entry totally made my mouth water… Buttermilk pancakes with crispy sugar-cured hickory smoked bacon!! !